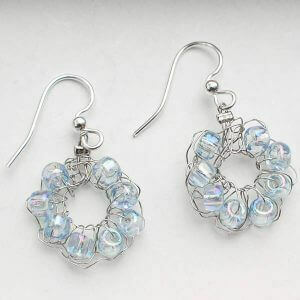 Of course when my daughters saw my medallion beaded earrings they wanted a pair of their own. I should know by now that I should just make three of everything. Luckily, I love doing this!For them I envisioned a pair that was smaller and daintier. I basically followed the same pattern as for mine, except I only worked the first round. I think they came out perfect! Beaded Single Crochet (bsc): Insert hook into specified stitch and draw up a loop, move bead up the wire to rest next to hook, yarn over and pull through 2 loops on hook. Thread 8 beads onto your wire. Round 1: Ch1 (does not count as stitch), work 8 bscs in 2nd ch from hook, join — 8 sts. Fasten off leaving a tail of approx. 6 inches. Add a crimp bead to the tail. Weave tail through the ear wire and back through the crimp bead. Flatten crimp bead to secure tail. Cut tail right after crimp bead. 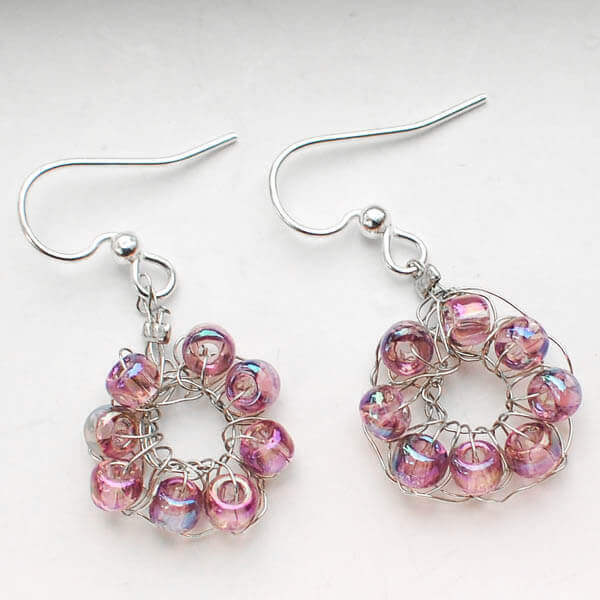 Curious – why “Thread 24 beads onto your wire” when you are only using 8 in each earring? Thank you for posting. I love these earrings. I am having trouble getting mine to look as symmetrical as yours are, but I will keep practicing. Which part are you having trouble with, Sarah? I love these earrings, but I am having a very hard time with this pattern. I’m not getting that nice empty center in the middle. Any tips would be greatly appreciated ! These are too cute. I think I might have the supplies to do this. I’ve never tried to crochet with wire before. I might have to give it a try! Very nice earrings Kara! Thanks for sharing your tutorial.